Potters Poultry International, from its base in the UK has been manufacturing and specialising in quality poultry equipment for 50 years. 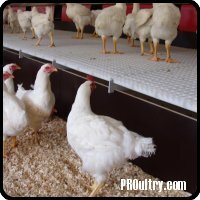 We are a world leading supplier of automatic nests, aviary and multi-tier systems, enriched cages, rearing solutions, plastic slats, feeders and drinkers for poultry. Covering 5 continents. T. van Gent BV produces house equipment for poultry for over 40 years. De products, laying nests and slatted floors, are since then being sold worldwide. Years of practice makes excellent results! This website informs you about the range of Van Gent roll away laying nests, the possibilities, accessories and services.